"FOR ADULTS ONLY! These are so delicious and one of my all time favorite party treats. Enjoy responsibly!" Heat water, lemon wedges, and white sugar in a large saucepan over medium heat. Simmer until sugar is dissolved, mashing lemons often to release juice and oils. Cook and stir lemon mixture for 5 minutes more, then remove from heat and allow to cool slightly. Strain lemon pieces from saucepan. Heat syrup and gelatin mixture over low heat until gelatin dissolves, 5 to 10 minutes. Remove from heat and allow to cool for 15 minutes. Pour lemon vodka into gelatin mixture and stir well. Pour mixture into a 9x13-inch baking pan; refrigerate until set, at least 6 hours. 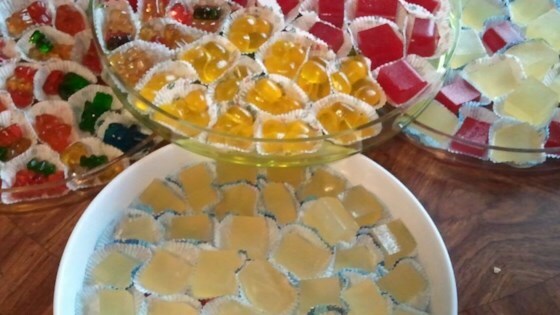 Run a sharp knife under hot water; cut gelatin into cubes with knife and sprinkle cubes with turbinado sugar before serving. Way too much vodka. Less would taste better.